Thank you for engaging the Diocesan Cycle of Prayer; your intercessions are greatly appreciated within the diocesan community. The Cycle of Prayer is currently in the process of being updated. Additional months will be posted as they become available. Please send any corrections to media@ladiocese.org. Commemorations are drawn from the book A Great Cloud of Witnesses (Church Publishing, 2016). Monday, April 1 [Frederick Denison Maurice, priest]. Clergy: Judith Baldwin (1987), Roberta Morris (2012). Tuesday, April 2 [James Lloyd Breck, priest]. Agencies: St. Anselm’s Cross-Cultural Community Center, Garden Grove (1976). Wednesday, April 3 [Richard, Bishop of Chichester]. Congregations: St. Richard of Chichester, Lake Arrowhead (1981). Thursday, April 4 [Martin Luther King, Jr.]. Clergy: Warner Traynham (1962). Friday, April 5 [Pandita Mary Ramabai, evangelist]. Clergy: Greg Bayaca (1961). Widows: Ruth-Alice Hailwood (Edward, 2006). Saturday, April 6 [Daniel G. C. Wu, priest]. Institutions: The Canterbury (Episcopal Communities and Services), Rancho Palos Verdes (1983). Sunday, April 7 [Tikhon, Patriarch of Russia]. Clergy: James Willems (1985). Monday, April 8 [William Augustus Muhlenberg, priest]. Institutions: Episcopal Communities and Services, Pasadena (1923, founded as The Episcopal Home, Alhambra). World Mission Companions: Diocese of Jerusalem — Savior Church, Kufr Yasif; Savior Church, Zerka; Redeemer Church, Amman. Tuesday, April 9 [Dietrich Bonhoeffer, martyr]. Widows: Anna Dawson (D. Miles, 1971). Wednesday, April 10 [William Law, priest; Pierre Teilhard de Chardin, scientist]. Organizations: The Order of the Daughters of the King (1885). Clergy: Stephen Huber (1999).Widows: Jane Ayres (Richard, 1990). Thursday, April 11 [George Selwyn, bishop of New Zealand, and of Lichfield]. Clergy: Philip Robb (1957), Rand Reasoner (1981), James Wright (2005). Friday, April 12 [Adoniram Judson, missionary]. Clergy: Mark Stuart (1980). Saturday, April 13. Widows: Phoebe Pao (Benjamin 1998). Palm Sunday, April 14 [Edward Thomas Demby, 1957, and Henry Beard Delany, bishops]. Clergy: Anthony Guillen (1985). Tuesday, April 16 [Mary (Molly) Brant (Konwatsijayenni), Witness to the Faith among the Mohawks]. Diocesan Clergy Renewal of Vows, St. John’s Cathedral. Good Friday, April 19, Churchwide Observance: The Good Friday Offering serving the Episcopal Church in the Province of Jerusalem and the Middle East (1922). Saturday, April 20, Easter Even. *Church of the Angels (The Bishop’s Chapel), Pasadena (1889). Easter Day, April 21 [Anselm of Canterbury]. Congregations: St. Anselm’s, Garden Grove (1953). Clergy: Robert Burton (1975), Thomas Quijada-Discavage (1989), Stephen Mung’oma (1991), Laurel Johnston (2007). Thursday, April 25, (Mark, Apostle). Congregations: St. Mark’s, Glendale (1889); St. Mark’s, Altadena (1907); St. Mark’s, Upland (1910); St. Mark’s, Downey (1924); St. Mark’s, Van Nuys (1925); St. Mark’s in-the-Valley, Los Olivos (1943). Schools: St. Mark’s School, Upland (1982). Clergy: Matthew Ahn (1967), Yein Esther Kim (2015). Friday, April 26 [Robert Hunt, priest at Jamestown]. Clergy: Judy Ming Lin, Deacon (2008). Saturday, April 27 [Christina Rossetti, poet]. Clergy: Peter Krietler (1970). Monday, April 29 [Catherine of Siena]. Clergy: J. Jon Bruno (Bishop, 2000). Friday, March 1, [David]. Clergy: Thomas Clarke (1971), Stephen Y. C. Kim (1975), James Seipel (1969), Elizabeth Starbuck (1994). Ash Wednesday, March 6. Widows: Elodie Carlton (Ainsley, 1971) [William W. Mayo, Charles Menninger, & Sons]. Friday, March 8. Clergy: James Seipel (1969), [Geoffrey Anketell Studdert Kennedy, Priest]. Friday, March 9, [Gregory of Nyssa]. Organizations: The Episcopal Church Women of the Diocese of Los Angeles (1895). Clergy: Gary Hand, Norman Ishizaki (1968). Monday, March 11. Clergy: Michael Flynn, Douglas Vest (1967). Widows: Evelyn Samartha (Michael, 1996). Tuesday, March 12, [Gregory the Great]. Congregations: St. Gregory’s, Long Beach (1957). Clergy: Richard Avery, Charles Sacquety, Richard Van Horn (1966), John Fuller (1962). Wednesday, March 13. Clergy: Joy Magala (1994), James Lander III (2004), [James Theodore Holly, Bishop]. Saturday, March 16 [Cyril of Jerusalem]. Clergy: Michael Griffith (1974); Jeannie Martz (1991). Monday, March 18 [Richard Allen]. Clergy: Greg Richards (1971). Tuesday, March 19 [Joseph]. Congregations: St. Joseph’s, Buena Park (1957). World Mission Companions: Diocese of El Salvador — Iglesia de San Jose. Thursday, March 21 [Thomas Cranmer]. Clergy: Howard Cartwright (1970); Pray for Justin Welby on this anniversary of his enthronement as 105th Archbishop of Canterbury (2013). Sunday, March 24 [Oscar Romero]. Clergy: Mark Weitzel (1990). Widows: Dorcas Bacot (Dan, 2006). Monday, March 25. Feast: Annunciation of Our Lord. Congregations: St. Mary in Palms, Los Angeles (1923); Holy Nativity, (Westchester) Los Angeles (1945); St. Gabriel’s, Monterey Park (1983). Clergy: Kenneth Kaisch (1977), Juan Jimenez (1988). Tuesday, March 26 [Richard Allen]. Clergy: Gustavo Hernandez (1984); John Forney (1987). Wednesday, March 27 [Charles Henry Brent, Bishop]. Clergy: Douglas Judson, Daniel Swift (1971). Saturday, March 30 [Innocent of Alaska, Bishop]. Clergy: Gregory Straub (1974). Widows: Victoria (Tory) Rihimaki (James, 2007). Sunday, March 31 [John Donne]. Clergy: John Phalen (1963). Friday, February 1, [Brigid of Kildare]. Clergy: James Billington (1997) Schools: All Saints by-the-Sea School, Santa Barbara (1965). 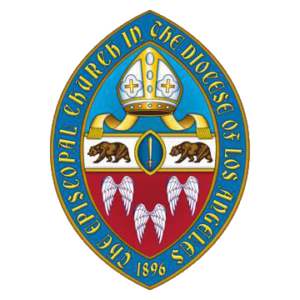 Diocesan Newspaper: The Episcopal News (founded in 1897 as The Churchman and Church Messenger of Southern California). Saturday, February 2, Presentation of Christ in the Temple [Esther John]. Clergy: Hartshorn Murphy (1974), James Newman (1979). Sunday, February 3, [The Dorchester Chaplains: George Fox, Alexander D. Goode, Clark V. Poling & John R. Washington; Anskar] Clergy: Richard Harms (1959), Christine Purcell (2005). Tuesday, February 5. [Roger Williams & Anne Hutchinson]. Clergy: Susan Klein (1978); Gregory Larkin; John Saville, III (1983). Widows: Mary Bayard (Eldon, 1997). Thursday, February 7. Schools: Campbell Hall, North Hollywood (1944). Friday, February 8 [Bakhita]. Institutions: Hillsides (Home for Children), Pasadena (1913). Thursday, February 9. Clergy: Robert Bethancourt (1980), Russell Murphy Jr.
Monday, February 11 [Frances Jane (Fanny) Crosby]. Clergy: Kathleen Dale (1979). Tuesday, February 12 [Charles Freer Andrews]. Clergy: Susan Bek, Cynthia Jew (2011). Wednesday, February 13, Absalom Jones. Clergy: Artemio Zabala (Priest, 1965; Bishop, 1989), Mark Henrickson (1981), Widowers: W. Averell Brown (Esther, 2008). Thursday, February 16 [Charles Todd Quintard]. Clergy: Bert Anderson (1960), Arthur Toro (2002). Friday, February 17 [Janani Luwum]. Widows: Nancy Carroll (Edward Eagle, 2003). Tuesday, February 19 [Agnes Tsao Kou Ying]. Clergy: Richard Belliss (1957). Widows: Frances MacDonald (Richard, 1998), Aljean Peterson (Stanley, 1998), Ana Maria Carlo (Jose, 2000). Thursday, February 21. Clergy: Dean Farrar (1976), Judith Mackey (Deacon, 1986). Saturday, February 23 [Polycarp of Smyrna. Kate Harwood Waller Barrett]. Clergy: Rene Barraza (2008). Friday, February 24, Matthias, Apostle. Congregations: St. Matthias, Whittier (1896). Clergy: Paul Lawson (1981). Widows: Linda Burrows (Robert, 2001). Monday, February 25 [John Roberts]. Clergy: Constancio Manguramas (1965). Thursday, February 28, [Anna Julia Haywood Cooper & Elizabeth Evelyn Wright]. Clergy: Roland Thorwaldsen (1953). Widows: Ada Hammond (Reid, 1974). Tuesday, January 1, New Year’s Day [Feast of the Holy Name]. Congregations. Faith Church, Laguna Niguel (1991). (1963); Clergy: Alice Callaghan (1982); Graham (Pete) Berry (1985); Peter Clergy: Barry Verdi Browning (1992). World Mission Companions: The Diocese of Jerusalem — Holy Family, Raineh. Thursday, January 3 [William Passavant; Vedanayagam Samuel Azariah, Seraphim of Sarov, Juliana of Lazarevo]. Clergy: Martha Siegel (1987). Friday, January 4 [Elizabeth Seton, Thomas Atkinson]. Clergy: David Caffrey (1975), Douglas Gordon (1986), Glenn Libby (1996); Carren Sheldon (2014). Sunday, January 6, Feast of the Epiphany. Congregations: Church of the Epiphany (Lincoln Heights), Los Angeles (1886); Church of the Epiphany, Oak Park/Agoura Hills (1980). Clergy: Jan Womer (1968); Michael Neils (1977); Eduardo Bresciani, Nancy Brown, Anna Olson, Robert Two Bulls, Pamela Tyler (2001), Colleen Sterne (2007); Mark Bradshaw (2018). Monday, January 7. Clergy: Carole Herzog (1984; Patricia Ash, Karri Backer, Hsin-Fen Chang, Mary Crist, David Erickson, Heather Erickson, John Livingston, Elizabeth Williams (2012). Tuesday, January 8 [Harriet Bedell]. Clergy: Rick Byrum, Marilyn Omernick (2000); Michele Baker-Wright, Michael Bell, Mary Marjorie Bethea (2011). Wednesday, January 9 [Julia Chester Emery]. Clergy: Anthony Jewiss, Barbara Stewart (1993); Juan Barragan, Joyce Stickney (1999); Amy Cox, Kate Cress, Jonathan Dephouse, Melissa Campbell-Langdell, Lucinda Voien, Paula Jo Vukmanic, William Wells (2010). Widows: Helen Francis (Michael, 1993). Thursday, January 10 [William Laud]. Clergy: Charles Stacy (1970); Michael DiCarlo (1981); Beryl Nyre-Thomas (1987); Jeffrey Clawson, Shannon Collis, Allison English, William Garrison, Victoria Mouradian, Richard Whittaker, Jr. (2010). Friday, January 11 [Mary Slessor]. Clergy: Mark Asman (1976); Alice Callaghan; Virginia Erwin (1987); Peter Browning, Deborah Dunn, Lisa Rotchford, Aidan Koh, Gary London, Hank Mitchel (1992); Michael Seiler (1998); Earl Gibson, Katherine Lewis, Garrett Mettler, Amy Pringle (2003); Linda Wirt Ahron, Jenifer Chatfield, George Daisa, Steven DeMuth, Nancy Frausto, Francisco Garcia, Sally Howard, Stephanie Wilson Brown, Marianne Zahn (2014). Saturday, January 12 [Aelred of Rievaulx, Caesaria of Arles]. Clergy: David Duncan, Robert Gaestel, John Kpoto, Lorne Weaver (1980); Toni Stuart (1990); Hong Nguyen, Jo Ann Weeks (1991); Emilie Bush, Carolyn Estrada, Julie Morris (2002); Bonnie Brandon, Jason Cox, Thomas Hui Liang Ni, Lester Mackenzie, Karen Maurer, Ada Wong-Nagata (2008); James Lee, Edith Oloimooja, Sharon Sheffield (2013); Laurel Coote, Joseph Courtney, Antonio Gallardo, Carol Horton-Howe, Jennifer Wagner Pavia, Sarah Anne Reynolds, Anil Shaw (2019). Monday, January 13 [Hilary of Poitiers]. Congregations: St. Hilary’s, Hesperia, 1988. Clergy: Judith Heffron, Susan Purnell (1990); Lynda Crow, Carrie Patterson Grindon, Norman Hull, Mark Kowalewski, You-Leng Leroy Lim, Ramiro Rodriguez (1996); Holly Cardone, Robin Kassabian, Elizabeth McQuitty, Edward Milkovich, Gethin Wied (2018). Tuesday, January 14 [George Berkeley]. Congregations: Holy Faith, Inglewood (1913). Clergy: Jon Bruno (Priest, 1978; Bishop, 2000),Steven Galipeau, Christopher Rubel (1978); Peter Rood, Joanna Satorius, Susan Scranton (1995); Edward Sniecienski (Deacon, 2005); Charles Asher, Mark Hallahan, Abel Lopez, Melissa McCarthy, Elizabeth Munoz, Sarah Nichols, Neil Tadken, Richard Tiff, Mary Trainor (2006); Brian O’Rourke (2012); Norma Guerra, Louise Macatee, Jana Milhon-Martin, Christopher Montella (2017). Wednesday, January 15 [Maurus & Placidus; Birthday of the Rev. Dr. Martin Luther King, Jr.]. Clergy: Charles Belknap, Gary Hall, Victoria Hatch, Mark Shier (1977); Philip Lance (1988); Virginia Benson, Eleanor Owen, Anne Tumilty, Robin Underhill (1994). Wednesday, January 16. Clergy: Robert Hauert (1960), Elizabeth Hooper-Rosebrook (1988); Nathan Biornstad, Gina Gore, Peter Hwang (2016). Thursday, January 17 [Antony of Egypt]. Clergy: Robert Dannals (1982); Betsy Anderson, Jamie Edwards-Acton, Diane Jardine Bruce (Priest, 1998; Bishop, 2010), Holger Laske, Katharine MacKenzie, Susan Russell, Keith Yamamoto (1998); Todd Blackham (2015); Katie Cadigan, Ann Brant Calhoun, Martha Johns, Nathaniel Katz, Lorenzo Lebrija, Chitra Rao (2015). Friday, January 18. Confession of St. Peter. Week of Prayer for Christian Unity begins (continuing through January 25). Please remember the people of the Roman Catholic Archdiocese of Los Angeles, and the Southwest California Synod of the Evangelical Lutheran Church in America, which whom the Episcopal Diocese of Los Angeles on November 21, 1993, launched a covenant relationship rooted in baptism. Please also remember the people of the Roman Catholic Diocese of Orange, the Roman Catholic Diocese of San Bernardino, and the Pacifica Synod of the Evangelical Lutheran Church. Congregations: St. Peter’s, San Pedro (1885); St. Peter’s, Santa Maria (1915), St. Peter’s, Rialto (1957). Clergy: Larry Brown, John Conrad, Margaret Cunningham, Steve Dean, Faye Hogan, Marilyn Mason (1997). Saturday, January 19 [Wulfstan of Worcester]. Widows: Katherine Robertson (David, 1978). Friday, January 20 [Fabian]. Clergy: Huston Horn (1970). Saturday, January 21 [Agnes & Cecilia]. Clergy: George Woodward, III (1984); Ellen Hill, Anne Sutherland Howard, Sarah Koelling Belknap, Antony Miller (1989). Tuesday, January 22 [Vincent]. Clergy: Robert Cornner, Lynn Jay, Patricia O’Reilly (1983); Karen Calafat, Michael Cooper, Gwynne Guibord, Rachel Nyback, Nancy Sinclair, Kathleen Sylvester, Cindy Voorhees, Ellen Wekall, Christopher Worthley (2005). Wednesday, January 23 [Phillips Brooks, Satoko Kitihara]. Clergy: Stephen Williams (1977); Thomas Jayawardene (1978); Kristin Neily Barberia (1991). Thursday, January 24 [Ordination of Florence Li Tim-Oi]. Clergy: Robert Moon, Laura Queen (2004), John Harvey Taylor (Priest, 2004; Bishop, 2017); Catherine Wagar (Deacons, 2010). Friday, January 25, Conversion of St. Paul the Apostle. Congregations: Cathedral Center of St. Paul (1864); St. Paul’s, Pomona (1881); St. Paul’s, Ventura (1888); St. Paul’s, Santa Paula (1892); St. Paul’s, Lancaster (1930); St. Paul’s, Barstow (1949); St. Paul’s, Tustin (1960). Institutions and Organizations: Canterbury UC-Irvine (1966). Clergy: Richard Swanson (1965). Widows: Beatrice Borrell (Eldon, 1991). Saturday, January 26 [Timothy & Titus]. Congregations: St. Timothy’s, Compton (1925); St. Timothy’s, Apple Valley (1955). Schools: St. Timothy’s School, Compton. Clergy: Chester Talton (Bishop, 1991). Monday, January 28 [Thomas Aquinas, Issac of Nineveh]. Congregations: St. Andrew & St. Charles, Granada Hills (1957). Clergy: Alene Campbell-Langdell (2010). Widows: Ann Howe (Chester, 2005). Wednesday, January 30. Widows: Maria de la Luz (Alfonso Sanchez, 2010). Thursday, January 31. [John Bosco, Samuel Shoemaker]. Organizations: Girls’ Friendly Society (1877). Widows: Grace Reed (Walter, 1977).